Brunswick is relaunching the Quantum product line with the Quantum Forest Green Solid. This line of bowling balls features single density cores along with thicker urethane coverstocks. This thicker coverstock offers durability, longevity, and massive hitting power. This ball is unique in that each core has a unique design to compensate for the gross weight of the ball, the core's dynamics, and the balls hook potential. This ball uses Brunswick's PK2016 Pearl coverstock formula which creates skid through the front part of the lane, then a powerful breakpoint reaction, and finally an impressive backend reaction when bowling on medium oil conditions. I laid out my Fire Quantum exactly like my Vintage Danger Zone which is 45 x4 ¾ x70. The Fire Quantum is a ball that allows me to control the drier lanes. This ball is not an everyday league ball for me but it fills the gap I had in my bag to control the mids and backends in the later blocks of tournaments.. Compared to my danger zone the Fire Quantum is about a foot longer thru the fronts and about 3 less on the backend. 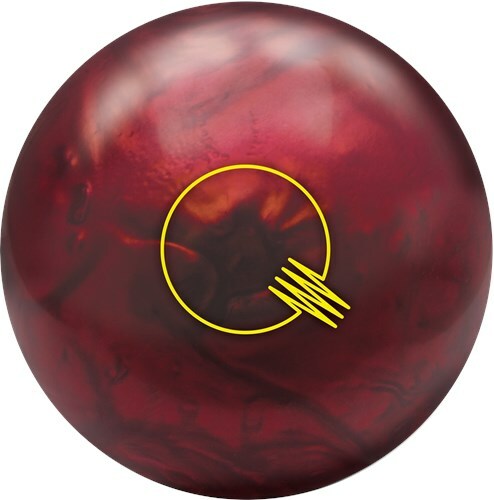 What I really like about the fire quantum is that I can stay left longer with the this ball a not give the pocket away where other high end balls I’m forced to play 3rd arrow or deeper. I drilled the Fire Pearl Quantum pin under to be a smooth, yet longer version of the Forest Green Quantum, and that’s exactly what I got. Using this ball on fresh THS is great, especially when I have room left with friction to wheel it off of, as it creates extra area and “miss room”. Being on the left side, I am able to play straighter with more aggressive equipment while still being able to “bang on it”, which is why the Fire Pearl Quantum was a perfect fit for my game. My first three game set on my league was a 720 with games of 239, 221, 260. The ball reaction is very clean through the heads and mid lane, but still gives a strong heavy roll into the pocket. I believe the combination of the strong symmetrical motor of the Quantum mushroom core, as well as the pearl cover stock, both allow this ball to achieve a more down lane type of hook, while still rolling heavy, which is the type of reaction you want from a versatile pearl. As far as comparison to other equipment, I played 5 boards further left with my feet, and 3 boards further left with my eyes than with the Forest Green Quantum. If you’re looking for that benchmark pearl ball in your lineup, then pick up a Fire Pearl Quantum. I was curious how the Fire Pearl Quantum would handle the longer oil pattern (45ft.) that Mexico City lays down, and was actually pleasantly surprised with the results. With a 5 1/4” pin under layout, the Fire Pearl Quantum starts its move early enough to give a more readable reaction on this oil pattern. If I had a long pin over layout, I don’t feel it would have given me the look I desired on this longer oil pattern. Carry percentage was the only issue on this pattern when it was fresh, but after throwing a few games, and breaking down the pattern (with the help of the Forest Green Quantum to burn up a spot), the Fire Pearl Quantum really shined. It’s a perfect compliment to the Forest Green Quantum, which worked great on Mexico City until they broke down, and then I could move right to the Fire Pearl Quantum and pick up where the Forest Green Quantum left off, playing a similar part of the lane. I shot games of 212, 209, 217 (fresh oil) and then games of 238, 245, 257 on the burn. On this pattern, I played 4 boards further left with my feet and 2 boards further left with my target than the Forest Green Quantum. The Team USA Los Angeles oil pattern is a 36ft. pattern, which was a great test to see how the Fire Pearl Quantum would react to the shorter length, and it really shined on the fresh oil. I was able to start left, placing the ball down around 11, catching my break point at the 5 board down lane, and the ball reaction was incredible. Even as I had to move inside as the oil pattern wore down, I was still able to get tremendous pin carry, which is something that many balls struggle with as you increase the angle off of your hand. I was able to play much straighter than I could with my Forest Green Quantum on this shorter oil pattern, and having that pearl cover stock really makes a huge difference, especially on these types of shorter oil patterns. I played 6 further left with my feet and 3 further left with my target than the Forest Green Quantum. Overall, I was very pleased with how the Fire Pearl Quantum held up on this shorter pattern. It will be the ball I start with going forward, and if they break down further I can go to my LT-48 or weaker pearl equipment when they really break down. I would say that overall the Fire Pearl Quantum is a must own for any bowler looking to add a ball that can handle a variety of lane conditions, from medium blends to shorter patterns. The cover stock is very surface adjustment friendly, so don’t be afraid to sand or polish the cover stock to your liking. This ball fits perfectly behind the Forest Green Quantum (very aggressive) and the Brute Strength (medium oil monster) in my arsenal, and it will be in my bag for a long time. If you’re a one day a week bowler, this ball will help get you the most bang for your buck, as the pearl cover will widen the amount of lane conditions you can hit with one ball, especially as patterns break down. Also, if you’re the serious, competitive bowler such as me, then this ball HAS to be in your bag at all times. I can’t wait to use it on an even wider variety of flatter tournament conditions and see this ball shine. If you’re looking for your next benchmark pearl ball, or looking to fill that gap between the super aggressive stuff and the milder reacting balls, check out the Brunswick Fire Pearl Quantum, you’ll be glad you did! The Quantam Fire Pearl is the perfect compliment to the Forest Green Solid. The Fire Pearl will be cleaner through the fronts and midlane but will have a super flip motion in the backend. I laid mine to compliment my Forest Green Solid when the front part of the lane starts to transition and it works perfectly. The Fire Pearl and the Forest Green are the perfect 1-2 combo to have in your bag. Drilled this ball pin over middle finger, box finish. Used on Autobahn after game 1 transition. This ball clears the troublesome midlane fairly easily, even for a low/medium speed player like myself. Hitting power was strong, and it seemed to create some mistake area right of my target that I wasn't seeing with other pieces. I saw it as about 5 boards stronger than my pearl Ridiculous, but certainly not too strong to avoid using on medium to lower volume patterns. A wonderful and necessary addition to any arsenal. I drilled my Fire Quantum with the CG right under the ring finger and the pin about .75 inch to the right and about 1 inch above the ring finger. I've found this ball to be smooth a little more on the smoother side, for a pearl, and it hits the pins incredibly hard. The ball will pick up just a bit sooner than most of my pearl equipment. This ball is a totally different look than anything I currently have in my bag. I definitely recommend it for medium to dry lane conditions. The pin carry and energy possessed in this ball are something that I have not seen before. I'd recommend this to anybody looking for a good benchmark ball. Likes: Clean through the heads with unmatched flip on the back storing more energy than any other ball. MUST HAVE!! Likes: Very Versatile ball. Can play down the boards or slow down and move inside to change the angle. This is my benchmark ball and I recommend it to beginners to pros. Dislikes: I have my pin up and on Pro conditions I find it sliding past the break point. Not the balls fault but mine for having pin way up. This ball clears the fronts for me easily and has a nice controllable but yet angular movement at the back end. I find it very very good on fresh house shots with the ability to play multiple angles. It is also very nice when you need to get a little deeper as the night goes on. The hitting power this ball has is extremely remarkable to say the least. I have the pins just dancing all over the lane deck at times. Don't be afraid to put a strong layout on this ball!! This ball is a blast to throw! If you purchase soon enough there is still the free 3 ball roller limited edition quantum bag. Cant beat this offer anywhere!! Layout: Pin 4" from PAP and below the fingers, with X hole down in the thumb quadrant. Factory surface. Likes: I'm not a high rev bowler anymore, so the stronger layout has helped. The thing that stands out for me with this particular ball is the carry. Shots that look like a flat 10 carry more often than not. I leave far fewer corner pins than normal. The ball's unique construction should lead to durability for years to come with normal maintenance, which should offset the slightly higher price of production (3.5 times more coverstock than normal). I can play straighter lines through the heads with ease, while the higher rev bowler should be able to open their angles a bit more. For me, this ball is a "can't miss" for my style and is always in my bag. The new Fire Quantum is part blast from the past and part technological marvel. The mushroom block pairs well with the new Powerkoil 2016 cover to form one of my favorite ball motions ever. It gets fantastic length down the lane and recovers very well on shots missed wide of target. The Fire Quantum is the perfect step down from the Forrest Green Quantum when it is a little too strong or you need a bit more recovery down lane. It also has enough midlane read to use on some fresh patterns. I have shot 300s with both of the new Quantums and I have found them very difficult to put down no matter what I use them on. The carry is phenomenal! I have noticed an improvement of a strike or two a game over my other equipment. If your looking for extra backend recovery, more area, and a few more messengers check out the new Fire Quantum! The Brunswick Fire Pearl Quantum is an absolute gem. This ball is very smooth going down the lane. Gives me great length before it flips and hits with tremendous power. Since being left handed I'm able to move left and play up the boards and it allows me to open up the lane. it has a very smooth transition throughout the whole lane and hits like a truck when entering the pocket. I love the Brunswick line and the extra hitting power which is stored inside their balls. I love the smooth length from each ball and not the traditional skid/flip from other ball companies. If you have a ball that hooks the whole lane then you definitely want this Fire Red Quantum to be your versatility when the lanes are breaking down. The Fire Pearl Quantum has a similar motion to the original Quantum balls from 20 years ago because the construction, 2 piece ball, and core shapes are similar. With the pearl PK2016 coverstock formulation, it can handle medium amounts of oil and would work best when the lanes start to break down and you need a little more push through the front part of the lane. This ball has a higher RG which will help the ball get farther down lane before going into the roll stage. This ball is a great compliment when the forest green quantum is hooking too early. I used the pin down 60 x 4” x 75 dual angle layout on this ball to give me a smoother arcing type of motion on the lane. This layout works perfectly to create a smoother rolling ball with good continuation. I can use this ball close the same line as the forest green quantum but will get farther down the lane because of the pearl coverstock. I have used this ball on a flatter 39’ sport pattern later in the block when the forest green was hooking too early, and it allowed me to open up the lane a little without a skid /snap type of reaction because of my drilling. With the core weighing about 4 pounds, and 3.5 times more coverstock weighing about 11 pounds. This ball will transfer more energy to the pins, and create more opportunity to strike. The fire pearl quantum will give you a predictable ball motion, good continuation downlane, and will help you raise your strike percentage. Brunswick Quantum Fire. A must have ball in your bag. This has to be one of my favorite light oil balls. I loved the Brunswick Melee Jab. When that was discontinued I looked to the Quantum Fire to fill that spot. The house I bowl in on Monday night is so dry so playing down and in isn't an option for me. So left is where I start. This ball is so clean and predictable. Brunswick keeps pushing the edge with technology. Re-introducing the Quantum’s was awesome. The Forest Green Quantum provides excellent control with outstanding backend reaction. I don’t know that I’ve ever seen a solid ball get down the lane like this one does. If you’re looking for a benchmark ball for medium to heavy oil, get yourself a Forest Quantum. With the Fire Quantum you can use when you need a little bit more angle or when the lanes start to dry out. I found the Fire Quantum to be a little to clean for me, so I just cracked the surface with a 2000 grit siaar pad and the Fire Quantum REALLY came to life. WHAT YOU WANT TO TALK ABOUT CARRY? I was skeptical at first. Then the first night I used the Quantum’s in league I think I carried about 2 extra hits per game. These Quantum’s do have the extra carry percentage with carrying the marginal shots(weak 10s) and even helps break up splits. With there being two quantum’s(one solid and one pearl) you can cover such a wide range of ball motions.